This blog was originally posted on Nataša Ljubić Klemše's blog, and has been reposted and translated with her permission. T.E.D. is a program at the University of Illinois that brings together educational experts of the United States and Europe to virtually exchange practical experiences and discuss various educational topics in order to reveal the two groups' similarities and differences. This kind of educational diplomacy with educational experts ensures that multiple perspectives are considered in the debate and discussion of educational systems of participants' countries, as well as overcoming many cultural barriers, misunderstandings, and misconceptions. T.E.D. 2015 represents the fourth generation of the overseas educational talks. As the only participant from Croatia, I had the honor to present the state of education in Croatia to educational experts from around the world, to introduce them to certain components, and also to learn about the educational systems of other countries in the world. Online collaboration was carried once a week for 90 minutes per session from February to May 2015. The coordinator was Lucinda Morgan, a PhD student at the University of Illinois. 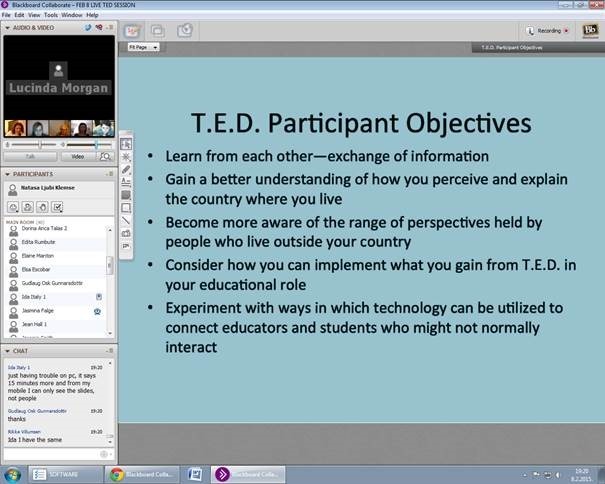 For communication, we used the Blackboard platform, and technical support was available from the University of Illinois. Moodle was used to exchange experiences amongst the participants, including discussions, debates and dialogues. All facilities and works that were created during the collaboration remain available to participants after each session. For the first three weeks, we got to know each other, and we went over the logistics of TED. Then we got started with the work. All the participants were, according to personal interests, divided into eight groups. Each group worked individually and prepared a joint presentation and supporting materials. Participating in the working group "Technology in the Classroom," I had the privilege to work with many experts from the US and Europe. In preparation of our joint presentation, we used a number of communication tools and worked day and night, due to the different time zones. We prepared a presentation of "Technology in the Classroom; Yesterday, Today and Tomorrow "in which I personally focused on the field of education in the future. I made part of my presentation on Education 3.0, which among other things includes eTwinning. I presented the core components of Education 3.0 and eTwinning to the class. During other presentations, I learned how to impress participants in the educational system, the different approaches to teaching, the evaluation and estimates on the impact of religion in education, homeschool education, the impact of immigration and migration on education and diversity education in rural and urban areas, the possibilities of international cooperation, and the future of education. One of the outcomes of cooperation on T.E.D. was the gathering of participants from T.E.D. 2015 on June 27, 2015 in Brussels, where additional exchanges and experiences were shared. 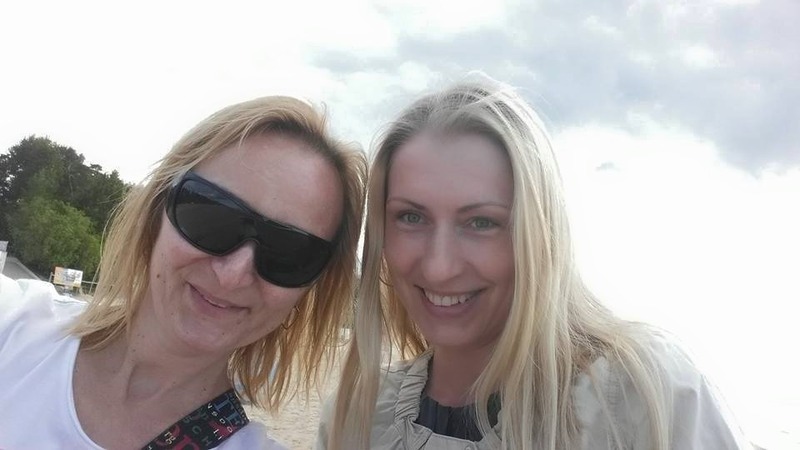 At the workshop on training for eTwinning ambassadors in Latvia from June 17-20, 2015, I had the opportunity to meet with Vaiva Ozoliņa, another TED 2015 participant with whom I worked in the group "technology in the classroom." The priceless experience of online collaboration turned into a direct experience of meeting each other in the Baltic states, which represents the point of working together. T.E.D. as a new form of transatlantic cooperation represents to me a totally new experience that has significantly enriched my professional CV. I am proud of all the new knowledge, new friends and acquaintances, and the opportunity to worthily present Croatia and how happy I am to be part of a great world educational system.